WE WANT TO HELP CREATE THAT PERFECT SPACE FOR YOU. 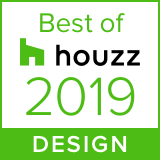 We recently were awarded a best of Houzz award, in the design category. This means out of all the photos from designers in the Newark, New Jersey area this photo of our Ashland Home Master Bedroom has the most saves! We are honoured to know how much you all love this room as we are a pretty big fans of it as well! Heres to a lot more great photos of great projects coming in 2019! What are we working on right now!